It's been a while and I've waiting to post about my feelings on the market until after the election. As you know, I've been pounding the table as a bear since the end of 2014. My thoughts changed back in June of 2016 but I wanted to wait until the election for confirmation. 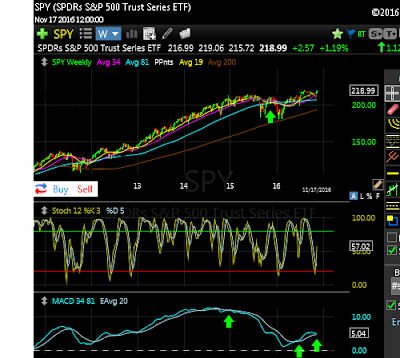 Below I will show a weekly chart of SPY to explain my extreme bearishness and then why I've changed my tune. First the chart. So I would like you to follow the green arrows from left to right. The first arrow shows when I first became bearish when my MACD(bottom of chart became inverted). When this MACD becomes inverted it is the first sign of a selloff. The data goes back over 100 years and is always accurate. I became bearish but if you recall, I said the Moving Averages(MA's) had to flatten first. The 2nd arrow on the top of the chart, is when the MA's flattened and I believed we would begin the big selloff. We did as you can see but were stopped out by the longer term MA(brown line on chart). We held that level and then the MACD became non-inverted in about June of 2016 as you can see by the 3rd arrow at the bottom of the chart. That is when the picture changed. The final arrow just occurred right as the election ended at the bottom of the chart. The MACD is non-inverted and we are bouncing off this level. 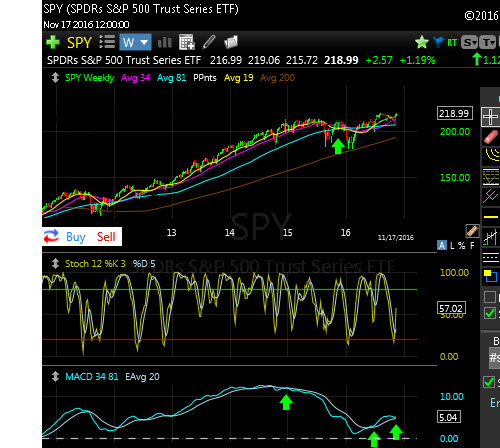 Going forward my targets in SPY are 226.50 then 237.75 over the next several months.